These cinnamon rolls are a family favorite. The great thing about them is you can make one batch and have enough for you and your neighbors! Here is my simplified and shortcut version for mixing the ingredients. 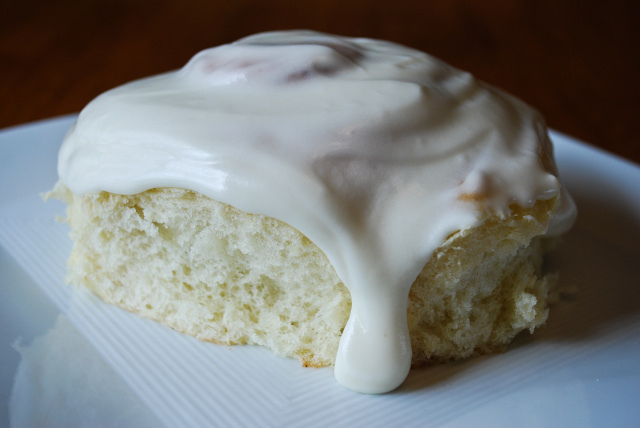 I've included some tips to help you learn from my experience making cinnamon rolls. Combine milk, shortening, mashed potatoes, waster, sugar, and salt in a microwave-safe bowl. Microwave on high for 3 minutes. After heated up and hopefully melted, stir the ingredients together. This is a good time to make sure the shortening melted properly. Add more microwave time if necessary. Just don't get the mixture crazy hot or you'll have to wait before putting it together with the rest of the ingredients. Put flour and yeast in your mixer. I like to mix them up a bit. If you have a smaller mixer or are nervous about combining all of the flour and liquid together in one step, feel free to start with only 1/2 of the flour here and then add the rest of the flour after adding the liquid. Once your Bosch or Kitchen Aid mixer works on it, it doesn't really seem to matter (to me). Optionally, add 2 tablespoons of soy/liquid lecithin. It helps the yeast grow a faster. (I learned this trick from Pantry Secrets. 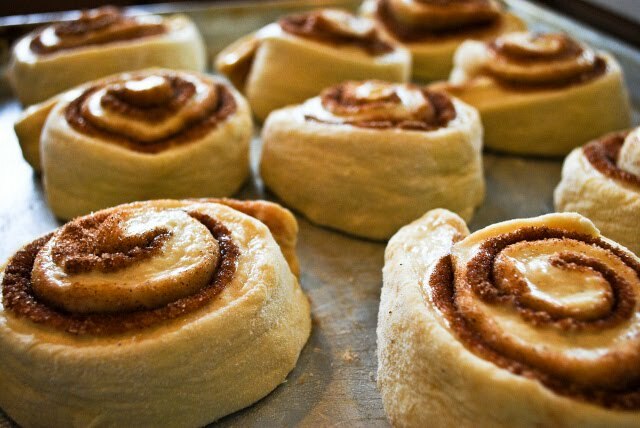 You could make cinnamon rolls with their simple generic dough recipe, but it's missing the nice properties you get from a potato dough.) Just squirt it on the dough in two globs each the size of a quarter. Don't measure, and don't get that stuff on your clothes! Add the eggs and the milk mixture. Mix and knead the resulting dough with the dough hook/attachment until soft and smooth. Spray the bottom of a large bowl with cooking spray. Place your dough in the bowl and apply some cooking spray on top to avoid sticking to the plastic wrap you'll put on top. What I've learned is to allow the plastic wrap to come down from the sides of the bowl and wrap the contour of the top of the dough. This keeps the dough from drying out on top. As the dough rises, it pushes the plastic up, but has enough give in it to go above the bowl, if necessary. Set the dough aside for a while until it doubles in size. If you added the lecithin, you won't have to wait longer than 15-25 minutes. If you didn't, it will take little longer. To speed up the process, put it in a warm place. To slow it down, toss it in the refrigerator or some other cooler spot. Ready to make the rolls? 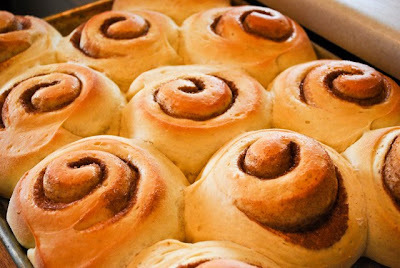 This recipe makes 2 dozen large cinnamon rolls, or 3 dozen medium-sized rolls. Decide which one you want and cut the batch into 2 or 3 portions. Each portion will be shaped to create a dozen. Roll out the dough to a rectangle shape with the dough about 1/2 inch thick. If you did 3 dozen, the dough will have to be thinner. Apply some moisture to the dough. Traditionally you can melt butter and spread it out, or to simplify add some water to your hands and pat them around the dough. The only disadvantage of the water method is if you get too much on there, your cinnamon can leak/drain out of the bottom of the finished product. Either way, it's quite similar. Sprinkle on cinnamon sugar. At the "top" of the dough (farthest from you), leave an inch or so uncovered. Roll up the dough, starting closest to you. You will have to go back and forth like a typewriter to roll the dough consistently. When you get to the "top" where the dough has no cinnamon, check to see if it has any moisture. If it isn't, add a small bit of water to the dough so that it will stick to your rolled portion. Make sure to put the seam on on the bottom touching the counter so that it has a good opportunity to melt together. Take some dental floss and slide it under the dough. Cross the front piece with the back piece and slice it in two. This is the cleanest way to cut cinnamon rolls. Sure you can cut it with a knife, but you want it to look good and you definitely don't want your nice knife's blade to be dulled by your hard kitchen counter (or cut your kitchen counter -- ouch). Cut 12 rolls. Spray a cookie sheet with cooking spray and place the dough rolls on the cookie sheet. Cover with a towel or loosely with plastic wrap (w/cooking spray) and let them rise. If you cook them before they are big enough, you will have dense rolls. You will regret it. When they are big enough, bake them at 350 degrees for 20 minutes. They should be lightly browned on top. After they come out of the oven, let them cool off a little bit before you get crazy icing them. At this point they are so hot that the icing will melt off too fast. If you like cream cheese, you'll love this. If you don't, you may want to go with a less glamorous icing. Thanks for sharing the recipe, instructions, and tips! We are sisters. Emily, Holly, Natalie, Cali, and Ashlee. Between all of us, we do bits of everything: crafts, photography, cards, sewing, quilting, decorating, and cooking. We love sharing our ideas with each other and with all of you.